Big Bang was rolling right along at Image Comics in October of 1996. With issue #5 we were maintaining a monthly schedule of 32 page 4-color comics of all-new material. Granted, we’d had almost a year to load up after leaving Caliber Press, but it was still a big deal for me/us. This was the Big Time and we seemed to be fitting in. Big Bang was, and is, an anthology book, each issue being a collection of different stories by different creators starring different characters. Why? 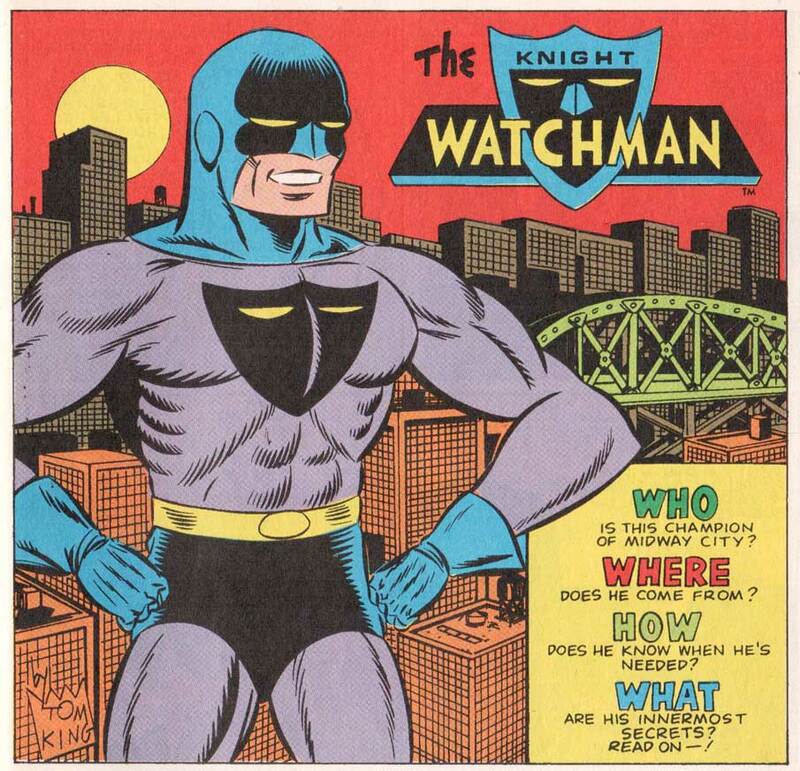 Why not Big Bang Comics Starring the Knight Watchman (or Ultiman, or whoever) every issue? The answer of course was money. Cold hard cash. Or the lack of it. The book had made a little money at Caliber Press. We were able to print in color there because of their distribution deal with Walmart, who got the books at a high discount. But it paid for the color separations and printing so we were able be in color on the Direct Market through Diamond Distribution. The profits weren’t enough for any of us to live on, much less all of us. I told anybody that wanted to work with us that Big Bang was a labor of love. People signed up to draw a story or two for very little pay. I was financing the whole thing out of my own pocket. I had made a little money from my Vanguard mini-series at Image. Unfortunately, it had been cancelled for selling less than 100,000 copies per issue. Those were heady times for the industry. We had high hopes that Big Bang’s move to Image would mean a much higher circulation and some actual profits, but it didn’t quite work out that way. I believe the new #1 sold about 12,000 copies and made a little money. The drop off in orders to #’s 2 (and 3 and 4) was steep and by the time of Big Bang Comics #5 we owed Image a couple of thousand dollars. Color sep fees were killing us. We had a choice: either stop publishing or drop the color. Since Image had to be paid back, we kept publishing in black and white and eventually got out of the red. More on that in the next few entries in this blog. But in the meantime, #s 5 and 6 had been solicited in color and were set to go. Big Bang #5 was cover titled “Top Secret Origins” and offered origins of the Knight Watchman, the Silver Age Blitz and Ultiman. The cover was mostly a montage of images taken from the stories inside, but the centerpiece was a Blitz figure by David Zimmermann. Dave was very instrumental to the development of Big Bang since our earliest days. 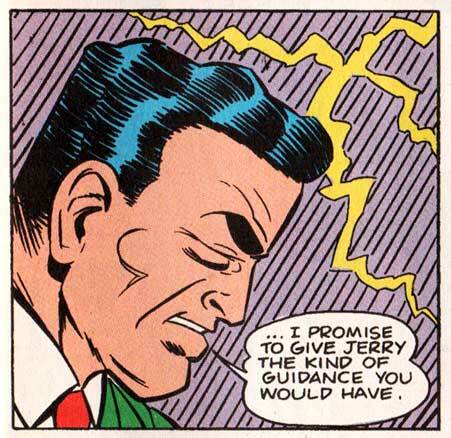 The initial back-up stories in Berzerker had been mostly Golden Age riffs. 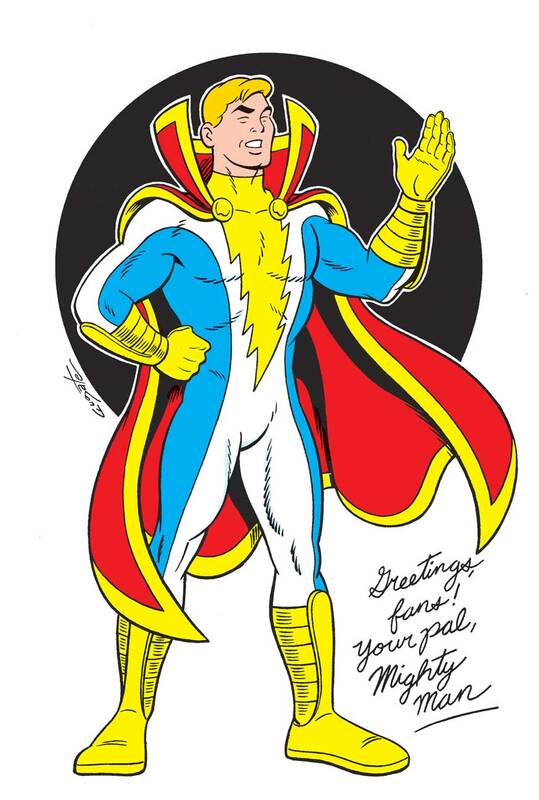 David sent in a number of drawings, including this one, that made doing credible Silver Age stuff seem like a reality. Thanks Dave! 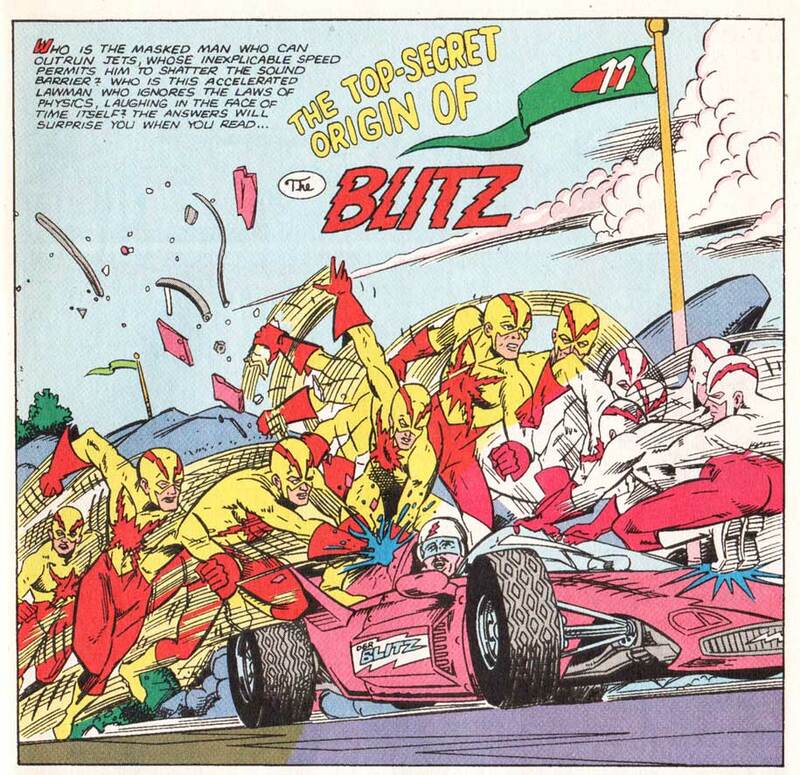 Terrance Griep, Jr. was back, after spearheading BB #4, with the scripting of the origin of the Silver Age Blitz. 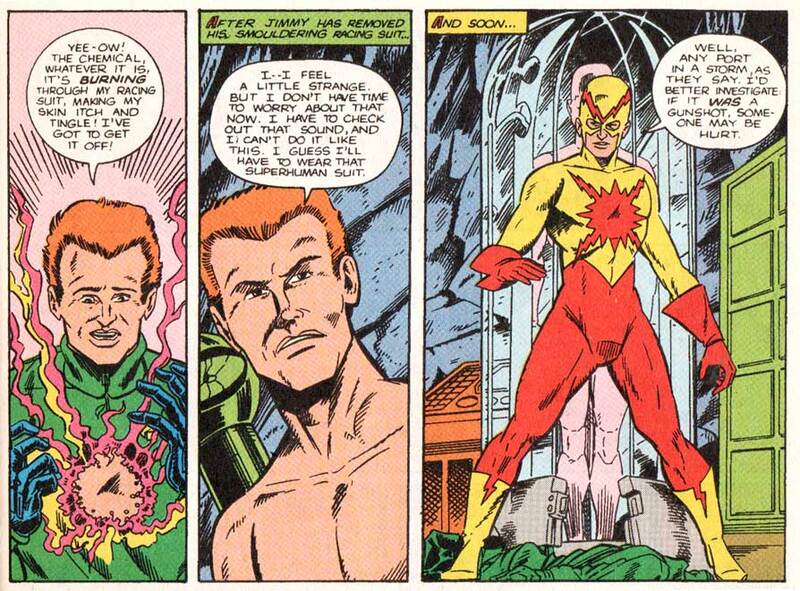 The story was penciled by Darren Goodhart, inked by Jim Brozman and lettered by Susan Dorne. It told the story of race car driver Jimmy Travis, whose car was sabotaged prior to a cross-county race in Monte Carlo. He crashed in a remote area and discovered an abandoned underground Nazi lab from the 1940s, where they had been trying to create the “Ubermensch,” an Aryan Superman. Two gamblers responsible for his crash follow Travis in to finish him off, and Jimmy gets doused with some old chemicals that burn him and his race suit. 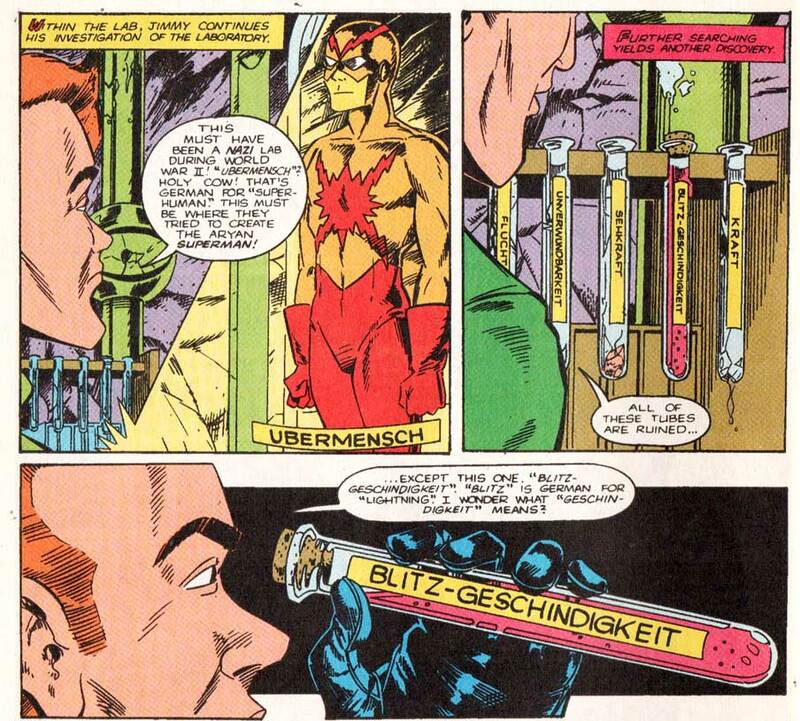 He puts on an old Nazi “super suit” and discovers that the chemicals have given him super speed. Quickly, he ties up the crooks, dismantles the car of the East German driver who had run him off the road and pushes his own car to the finish line, jumping in to coast to victory. The Blitz had been born. Next up was a reprint of the two page Ultiman origin written and drawn by Chris Ecker from Berzerker #2. I did drop in a different “title panel” to change things up a bit. It had been submitted by my long-time Megaton & Big Bang buddy John Thompson, and I especially loved his Ultiman logo. This was followed by Chris Ecker’s all-new origin of the Knight Watchman. Written, penciled and inked by Chris, it was inked by Jim Brozman and Mike Matthew. In it, college student and Olympic hopeful Reid Randall is called home to Midway City when his brother Ted runs afoul of gangster “Gentleman” Mac Duggin. Ted had run up some serious gambling debts and Duggin wanted the Reid family’s garment business as payback. The final story in the issue is “A Visit To Ultiman’s Secret Citadel,” in which Ultiman gives a lucky young boy named Jimmy a guided tour through his hidden sanctuary inside of a volcano. While it isn’t an origin story, it does offer a bit of info on how astronaut Chris Kelly gained his powers and became the Ultimate Human Being. The Citadel is kind of a combination of the Batcave and the Fortress of Solitude. 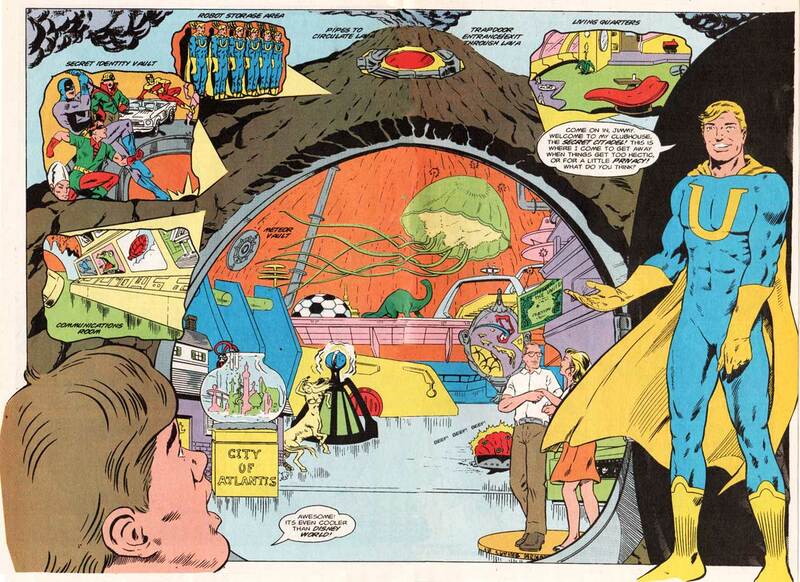 “A Visit To Ultiman’s Secret Citadel” was plotted and drawn by Ed Quinby, who had inked the Silver Age Ultiman story in BB #3. The scripting was a collaboration between myself and Ed, or perhaps just very heavy-handed editing on my part to get some details right that had so far existed only in my brain. 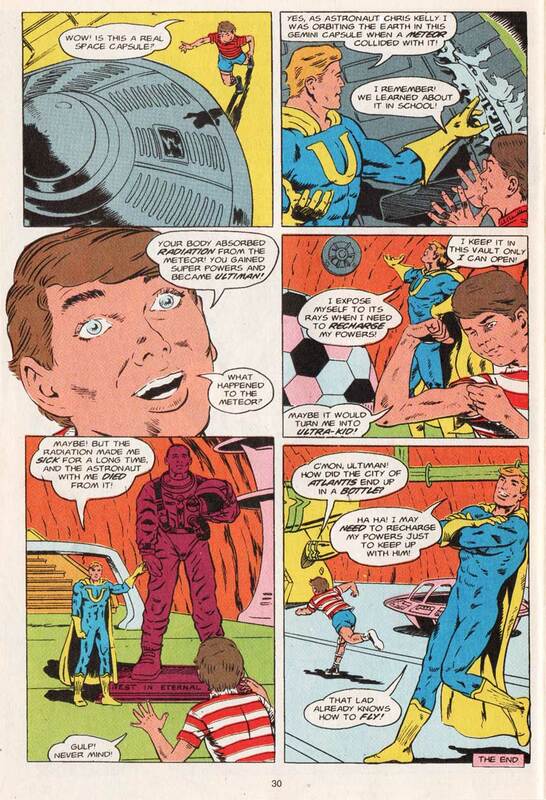 Overall, it tied together some things from the story in BB #3, and the original Ultiman story from way back in Megaton #1 some 14 years earlier. My favorite bits in the Visit were the bottled city of Atlantis and the info about the dead astronaut, to set up a still-untold story. And that was Big Bang Comics #5. Plus the letter column “Big Bang Theories,” and ad for the next issue, an ad for ACTION FIGURES UNLIMITED where Dennis Harry could create your own custom Big Bang action figures and a gorgeous back cover pin-up of Mighty Man by the wonderfully talented, and sorely missed, Bill Fugate.